Jesus spent much time explaining to his disciples 'what was said in all the scriptures concerning himself' (Luke 24:27), and yet many Christians find it difficult to relate the Old Testament to their own life situations, or neglect its original meaning in search of a direct personal or doctrinal application. Furthermore, debate continues about how to preach the Old Testament as Christian Scripture. David Peterson provides a model for how to do this, rooted in biblical theology, and uses it to expound and apply an important group of chapters from the prophecy of Isaiah. In their original context, and through their use by New Testament writers, these chapters provide a framework for understanding God's purposes for the world, and the central role of the Messiah in their accomplishment. 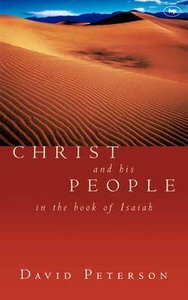 About "Christ and His People in the Book of Isaiah"
David Peterson (Ph.D., University of Manchester) is senior research fellow in New Testament at Moore Theological College, Sydney, Australia. Previously, he was principal of Oak Hill Theological College in London, England. Dr Peterson's publications include Hebrews and Perfection (Cambridge University Press), Possessed by God (Volume 1, New Studies in Biblical Theology, InterVarsity Press), Engaging with God (InterVarsity Press),(with I. Howard Marshall) Witness to the Gospel: The Theology of Acts and most recently The Acts of the Apostles (The Pillar New Testament Commentary.